Our master craftsmen at Furniture Medic by MasterCare Experts take great pride in providing quality furniture refinishing and restoration services that you have come to expect from the Furniture Medic name. We understand that in many cases furniture is more than a utilitarian object in your home or building, furniture can be a nostalgic reminder of the past and a connection to your roots. 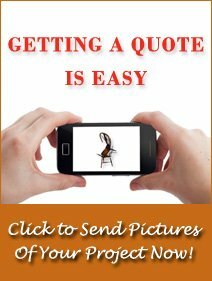 That is why we take the restoration and repair of antique furniture so seriously. 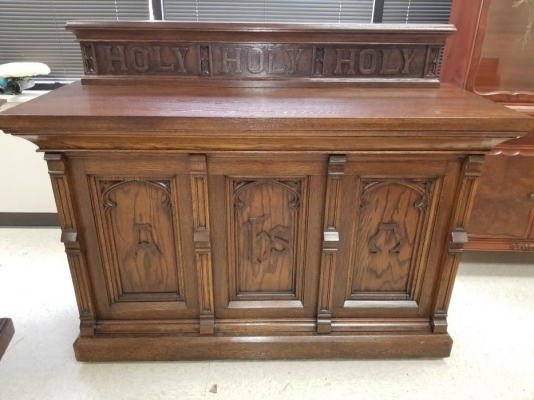 Antique furniture is important to those who own it because of the personal history and sentiment attached, and the same is also true of vintage furniture in a community church. Recently, a local church started a large renovation project to help improve the condition and appearance of the building. 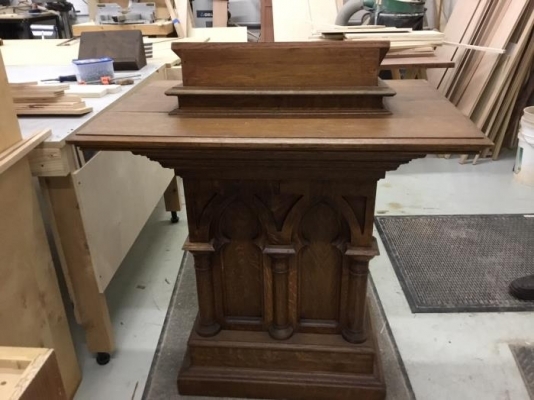 As part of this renovation project, the church wanted to restore some pieces of vintage furniture including a pulpit, alter, and baptismal bowl. These pieces have been a part of the church for a long time and it was important to the church and their congregation to revitalize and keep these relics of the past. They contacted our experts at Furniture Medic by MasterCare Experts to breathe new life into these pieces with our furniture restoration services. When we got the furniture from the church, it appeared rather dull. 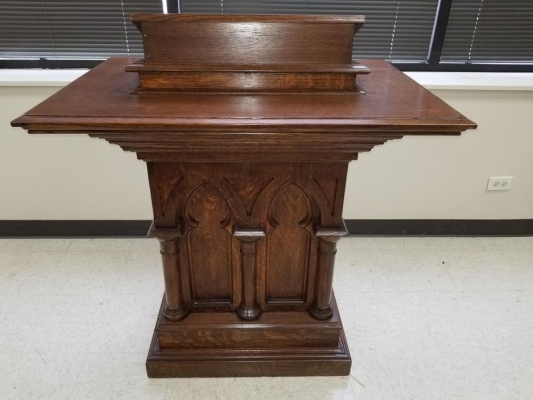 The church asked us to restore the furniture to make it look refreshed, but not new. It was important to the congregation that the furniture maintained its vintage look to keep them connected to their past. The congregation also asked us to have the furniture ready for their first service in their newly restored sanctuary on Easter Sunday. Our technicians set to work on the vintage pulpit, alter, and baptismal bowl, drawing on their refined skills and experience in antique furniture restoration. Our antique restoration techniques are minimally invasive to help preserve the original character of the piece, but also improve its appearance. 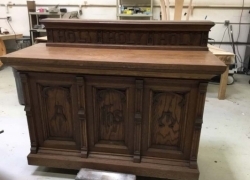 We reversed the discoloration that was causing the church furniture to look dull and helped return some life into the wood, without making it look too new. As a result of the restoration, the wood looks more vibrant, yet still rather old at the same time. Each of the pieces from the church includes intricate, ornate carvings that are much more apparent now that the discoloration has been reversed. 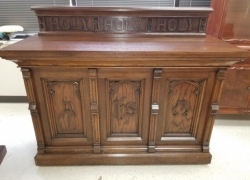 This is the most obvious in the words “Holy Holy Holy” engraved in the alter that are much easier to see in the after picture than in the before picture. Not only did we have the furniture ready for their Easter Sunday mass, but the congregation was happy with the results. 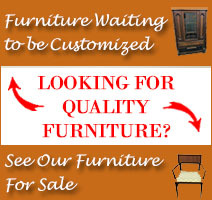 Furniture restoration and repair projects for antique furniture cannot be done the same as regular furniture. There are certain guidelines that must be followed during the restoration and repair process to preserve the original character of the piece so that it will still be considered an antique. According to the National Free Trade Act (NAFTA), a piece of furniture is considered an antique if it is over 100 years old, but it is no longer considered an antique if it has experienced more than a 50 percent change from its original character. Our craftsmen understand what it takes to provide effective restoration and repair services for antique furniture while preserving enough of its original character to maintain its antique status. 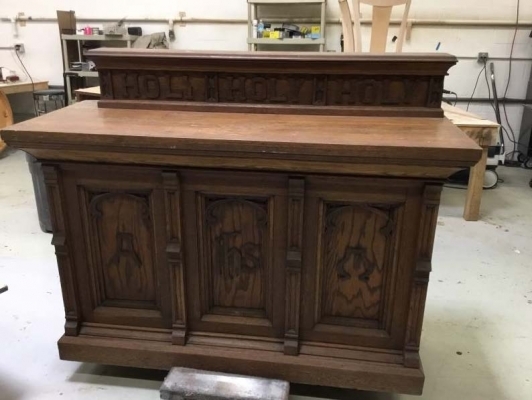 It is also important to maintain the original character of antique furniture for nostalgic and sentimental reasons, like in the case of the church furniture described above because the congregation wanted to preserve part of its past. Precision repair: We can repair minor damage to the surface of antique furniture including dents, scratches, stains, and gouges. Re-gluing/ minor adjustments: We can repair physical damage to the piece and re-glue or adjust broken components. 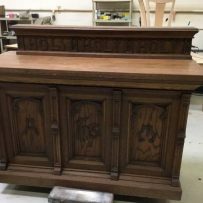 Restoration/ refinishing: We will restore or refinish the piece to reverse the effects of discoloration and general wear and tear while preserving much of its original character. Antique furniture is important to individual owners, as well as to community institutions like a church. At Furniture Medic by MasterCare Experts, we are always happy to breathe new life into antique furniture while keeping its original charm that made it such an attractive piece in the first place. If you need professional furniture refinishing, repair, or restoration services for your furniture, call our experts at (630) 653-3131 to learn more about these services. Is Your Table Ready for Thanksgiving?